Acupuncture is an old medical therapy, originating in China around 2000 years ago. It involes inserting very thin stainless steel needles into the body at specific points to relieve pain and encourage the body into a state of homeostasis – the appropriate balance of chemical reactions in the body that result in optimal health. There are two ways that we can view acupuncture working – the Eastern and the Western way. The Eastern way is that there is an energy that flows through the human body called qi (“chee”). This energy must flow smoothly and in an appropriate quantity in order for life to be sustained, and it flows along pathways called channels or meridians. When the flow of qi is obstructed, disease results. The idea behind acupuncture is that by inserting a needle into the body, the flow of energy at that point and channel can be released, increased, decreased, or otherwise rerouted. A skilled acupuncturist can pick which type of effect on qi they are looking for by choosing the correct points to needle and doing so in the correct way. The Western explanation is a little more complicated. 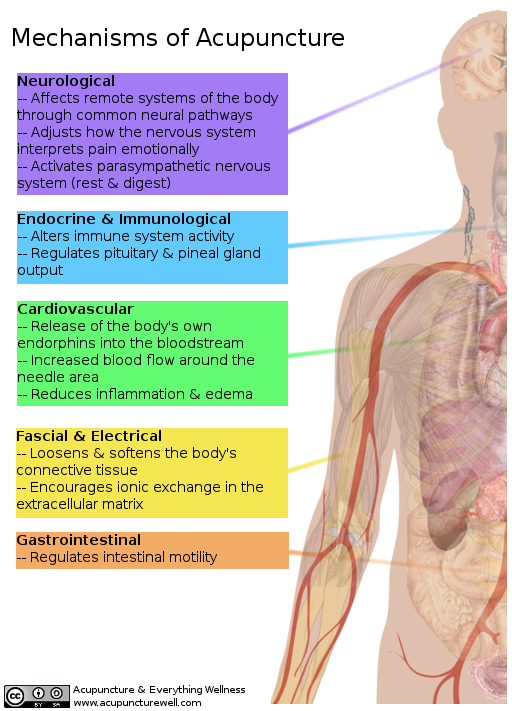 Multiple mechanisms have been proposed for how acupuncture works, and it turns out that putting a needle into the body initiates a cascade of reactions through the different systems of the body. You can see a broad overview of those effects in the image for this post (click it for a larger view). Most importantly, acupuncture stops pain. Inserting a needle causes the body to release its own endorphins and dopamine, which are same chemicals that give you a runner’s high – that feel good feeling after exercise. Acupuncture also helps to adjust blood circulation and reduce inflammation, because the body responds to a needle by bringing fresh blood and white blood cells to the place where it is inserted. This can help keep joints or other small or poorly nourished areas of the body healthy for longer periods of time. The rotating of an acupuncture needle in the body helps to loosen tight connective tissue which is a common cause of pain from repeated motion or actions, or trauma. The most pronounced effect of acupuncture, however, is neurological. We can show from MRI studies that putting a needle in the body at one location can stimulate the area of the brain that corresponds to a different location. This means that a needle can go in the arm or foot, and work on an organ, or a problem that’s mental (like anxiety). This is where the idea of qi or meridians intersects with Western science’s understanding of what acupuncture does. With all these actions on the body, acupuncture can treat a lot of different things. We talk about some of those things here as well as here. But better yet, schedule your consultation today to see if acupuncture can help you.